Get ready for one of the biggest weekend's of the summer as the festival season gets started in true style! 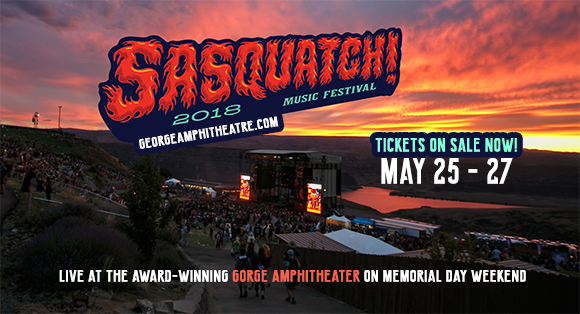 On Sunday 27th May, the 2018 Sasquatch! Festival will come to a close but not before an unforgettable last day at Gorge Amphitheatre!! Get ready to dance all day to the very best entertainment that money can buy! Don't miss your chance to be a part of it… with Washington's incredible, versatile music scene, Sasquatch! never ever disappoints – all genre's celebrated! Tickets are NOW on sale for the 2018 event – book yours today and kick start your summer, it's never too early! As it celebrates it's 17th year, the team at Sasquatch have taken on recommendations from fans on how to improve the weekend to ensure the best festival experience for all. The 2018 lineup will be bigger and better than ever and the festival vibes will continue to be in the same spirit the festival has always remained over the years! Along with a few exciting adjustments, the crew have also been working on a few new areas including a craft beer village! Come and celebrate with the Sasquatch! family in May 2018, for a weekend that will blow you away! Tickets are NOW on sale – day and weekend passes available.